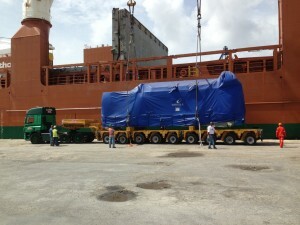 WILLEMSTAD - The Wärtsilä diesel generators have arrived at the utility company Aqualectra. Four Wärtsilä machines were shipped from Finland to become part of a new diesel plant in Aqualectra. If everything goes according to plan, this central, with a production capacity of 35 megawatts, will be opened at Dokweg in January 2015. The old installations at Mundu Nobo (near Otrabanda) will then be removed from production over a period of time. Aqualectra has announced in a press release that the transportation of these machines will take several days. Therefore, the company has hired a company that owns a huge trailer. The utility urges motorists to take into account the transport of these machines. This will be between Nieuwe Haven and Dokweg.